A new open-access paper on modelling glacier change in the Everest region is now out in The Cryosphere as well as a press release from the European Geosciences Union (EGU). The paper, written by an international team of researchers, presents the first detailed modelling study of all glaciers in the Dudh Koshi basin of the Everest region in Nepal. This blog post aims to provide a bit of background on modelling glaciers and glacier change, explain the methods we used and discuss the main results. The idea behind the study was to develop and test a model that could examine the sensitivity of glaciers in the Everest region (Figure 1) to both past and future climate change. Glaciers gain mass in the form of snow (accumulation), and lose mass mainly through melt (ablation). The annual sum of mass gained and mass lost is the “net balance”. It’s a bit like a bank account: you gain money and spend money over the course of a year. At the end of the year, if you’ve earned more than you spent, you’ll have a positive balance. Glaciers can be treated the same way, with annual field visits (or multi-annual remote sensing studies) used to check the income, expenditures and account balance. To model the snow accumulation and melt over all glaciers in the basin, we start with the APHRODITE temperature and precipitation product (Yatagai et al. 2012), which takes station data from across Asia and fills in the gaps using different methods of interpolation. We take these interpolations one step further, and develop daily estimates of temperature and precipitation at 90 m resolution over all glaciers in the Dudh Koshi basin (Figure 1), using elevation as a predictor. When precipitation occurs, the model counts it as snow if the temperature is below 0°C. When temperatures are above zero, melt occurs. The amount of melt is determined primarily by air temperature, but also by surface type (snow, clean ice or debris-covered ice) and aspect (southerly slopes have higher melt rates). So, for each grid cell, an annual mass balance can be calculated using simple accounting (Figure 2). Low-elevation glacier termini receive little or no snow and have higher melt rates that lead to overall negative balances. The highest elevations have positive balances as melt simply does not occur (temperatures are well below freezing—ask anyone who’s climbed Everest!). In the long term, it is not just about how much mass is gained or lost in a given year: glaciers also redistribute mass. Given enough time, snow accumulations at higher elevations are compressed into ice, and gravity makes the ice “flow” downhill. This is where things get complicated, because glacier ice can deform, and it can slide over the bed, and it typically does both at the same time. Our model simplifies the redistribution of mass from high elevations to low, because solving the ice flow and deformation equations at the basin scale requires information that we simply don’t have at the moment. That said; there are not many models that simulate the flow of glaciers for an entire catchment. In the calibration phase the model was run with 20 different parameter sets. To calibrate or “tune” the parameters in the mass balance and redistribution model, we compared model outputs from each set against observations of glacier extents, glacier area change, glacier velocities and observed mass balances. The results of the best-scoring parameter set were compared against other independent datasets to make sure that the model works properly. Once we trusted the model, we used it as a tool to examine glacier sensitivity to future climate change. 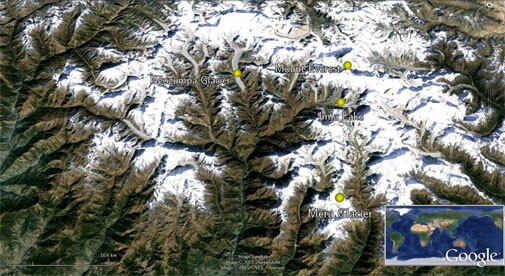 How will glaciers in the Everest region respond to future climate change? Some work has been done on this already by our colleagues Ben Marzeion and Valentina Radic, but these studies worked on a coarser scale and did not include mass redistribution. For our basin-scale study, scenarios of future temperature and precipitation changes were taken from the Coupled Model Intercomparison Project (CMIP5). We used both moderate (RCP4.5) and high-emission (RCP8.5) scenarios. And as different climate models can present substantially different projections of future climate for the same emissions scenario, we chose end-members that represented warm/cold or wet/dry models. Temperature and precipitation changes specified by each climate model were applied to the historical climate fields, and the changes in ice volume and area were tracked by the model. No matter which scenario or model type was used, the results were clear: glaciers in the Everest region could see sustained mass loss through the 21st century (Figure 4). The modelled glaciers are highly sensitive to temperature increases between +6 and +8°C by the end of the century. And these temperature increases do not explicitly include the amplification of warming at high elevations, which results from increased water vapour content and increased absorption of solar radiation as snowpacks decline. The increase in temperatures has two main effects on glaciers: first, it increases the amount of melt that occurs. Second, it raises the elevation of the freezing level, which has two secondary effects: the area exposed to melt will increase, and the amount of snow accumulation will decrease. To extend the tortured bank account analogy further, future warming will not only withdraw more money from your account, but it will also represent a cut in your income. 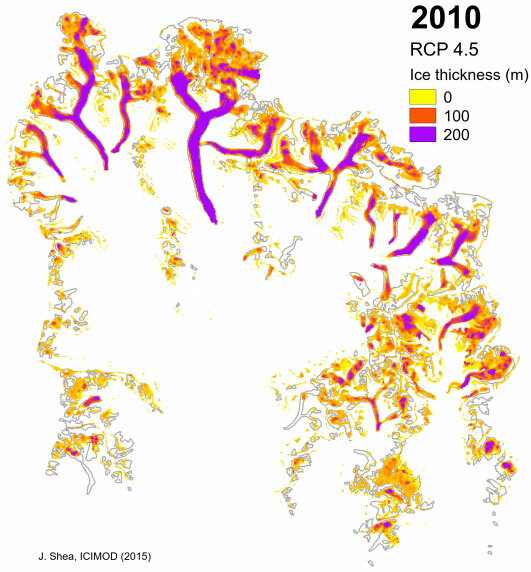 An animation of the modelled changes in ice thickness from one of the RCP4.5 scenarios (Figure 5) shows how debris-covered glaciers become detached from their accumulation areas, and smaller, low-elevation glaciers could disappear completely by the end of the century. 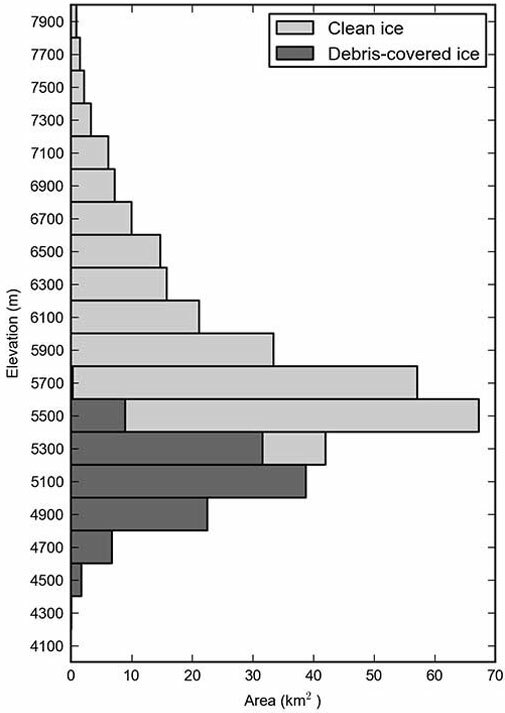 If we look at the distribution of glaciers with elevation (Figure 6), our results become less surprising. Glaciers in the Dudh Koshi basin are found mostly at elevations between 5000 and 6000 m.
The current equilibrium line altitude (ELA), the elevation where your bank account is neither negative nor positive, sits at approximately 5,600 m (Wagnon et al. 2013). A few degrees of warming will raise the ELA and expose large areas of ice to melt, while simultaneously reducing the area where accumulation occurs. So what? And what’s next? The loss of glaciers in the Everest region would be a pretty big deal. The monsoon is the main driver of streamflows in the region, but at higher elevations in the mountains glacier melt can be an important component of streamflow. These glaciers are also culturally and historically significant, and draw huge numbers of tourists and mountaineers every year. It is important to remember here that all models are simplifications of reality and tools that can be used to try and answer specific questions. Models contain a large number of uncertainties related to either the structure of the model, or the parameters used in the model, or the input data used. Often, it’s all three together. We discuss these uncertainties at length in the paper, because that’s what scientists are trained to do. But these uncertainties do not change the overall result of the research: glaciers in the Everest region will continue to decline in the 21st century and the losses will be greater for higher carbon emission scenarios. As for the next steps: the modelled changes in glacier volume need to be linked with a distributed hydrological model to assess seasonal changes in streamflow. It would also be great to see another team develop a different glacier model for the region, and either confirm or refute our results. 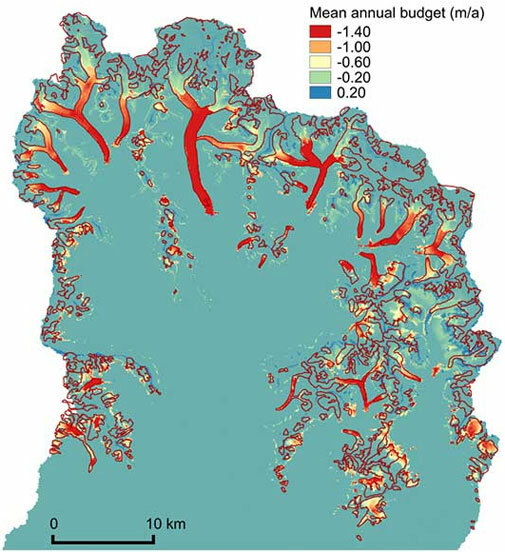 Improved representations of glacier dynamics (e.g. Clarke et al. 2015), high-altitude precipitation patterns, and debris-covered glacier melt processes are important targets. Finally, our results are aligned closely with glacier models developed for other regions of the world. In the Everest region, as in western North America, the Alps, Iceland, and New Zealand, the prognosis is not good. Future temperature increases are going to bankrupt mountain glaciers.